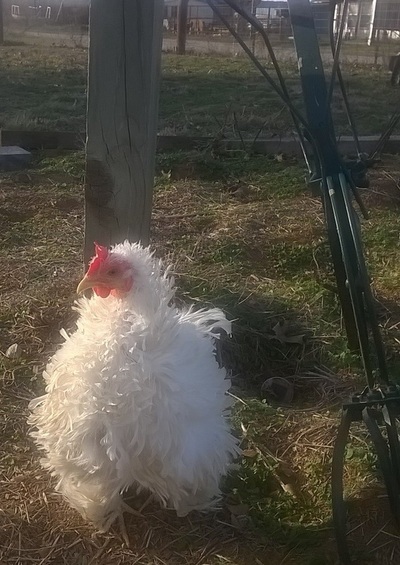 Lady Frizzle is a rescued chicken. 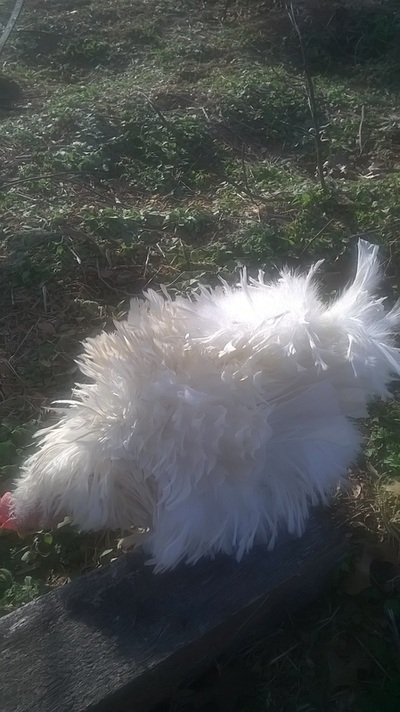 She is an adorable white frizzle bantam who was attacked by a skunk and rescued by Chicken Heaven On Earth. Watch these awesome videos of her dramatic recovery. Lady Frizzle came to Chicken Heaven On Earth in very bad shape. She had been purchased by someone who thought he was rescuing her from a farm where she had been housed with standard sized hens and roosters who mercilessly pecked her. The result was several peck wounds and many missing feathers. He brought the rejected hen home and a few days later she disappeared under his trailer house. When he found her he realized she had gone broody so he left her to hatch her eggs. A few days later a skunk decided he would take her eggs from her. Lady Frizzle did not give up her unborn chicks without a fight and unfortunately she was on the losing end of it. The skunk brutally mutilated her and ate her unborn chicks. Lady Frizzle was sad and very ill. The man did not know what to do so he contacted Chicken Heaven On Earth and we took Lady Frizzle in right away. Of course, she had to be quarantined for a short period while we examined her and watched for signs of other illness and possible parasite infections. After all that was taken care of we took a video to document her condition which was horrible and so sad but her attitude was good and that gave us hope even though they said she wouldn't make it. After almost 96 days Lady Frizzle has made a full recovery. Below you will see two videos. The first is of her deplorable condition when she arrived and the second is of her total recovery. Lots of prayers went up for this little lady. Despite her severe injuries she seems very alert and even happy to be in a safe place, and getting a lot of attention. Scroll down to see her complete recovery video! As you can see, in spite of all the people who said we should just kill her and put her out of her misery and the experts who said we could not save her...here she is and has made a 100% recovery!!! 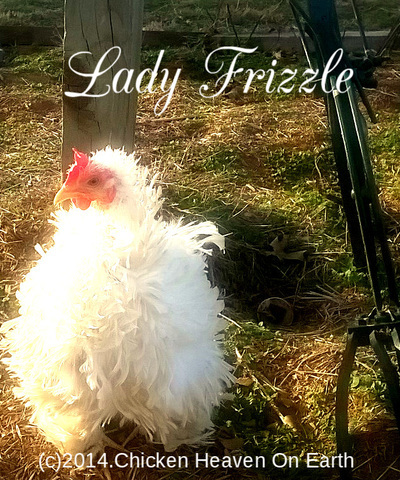 Lady Frizzle has charmed everyone she meets and has become part of Chicken Heaven On Earth's private stock and will soon be placed with Snowie's ladies. We are hoping to have fertile eggs for sale from Lady Frizzle soon. Scroll down to see more cute pics of Lady Frizzle. Keep scrolling to meet Lady Frizzle's First Baby Chick. New! See Lady Frizzle & Mr. Snowie's First Baby Chick! 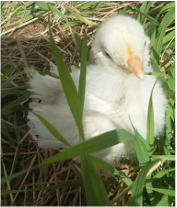 Lady Frizzle and Mr. Snowie (both rescued chickens) got together and made this tiny little Frizzle chick who will steal your heart..meet Lil' Snowball Lady Frizzle and Mr. Snowie's first surviving baby! Chicken Heaven On Earth Rescued Chickens and other people's rescued chickens too! Check Out These Smart Talented Chickens! It's amazing how smart chickens really are! Cute!!! See Chickens That Love to Cuddle! These adorable chickens love to get attention, snuggle, and cuddle. So adorable!